The travel agency Reisebüro Urlaubswelt from Schörfling at the Attersee, is the general agency for the Liveaboards Nautilus One & Two on the Maldives. The two boats cross between the atolls to find for divers the best diving places. of the Maldives on 1.190 islands – „the sunny side of life“. From flat corall-gardens to slopes, racy drift dives in chanels and some wrecks - you will get all. "Nautilus One" and "Nautilus Two", divers will enjoy an unforgettable and great dive trip on the Maldives. Book your dive holidays in paradise right now. The safari boats built in traditional Maldivian style with a spaciousness that distinguishes them nicely from other boats. The service provided is with a capital "S". The Maldives – "the sunny side of life" – 1,190 islands – some inhabited, some uninhabited – await you. 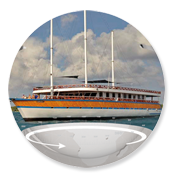 The Nautilus One and Nautilus Two safari boats bring you into the most beautiful atolls. is the perfect combination of a fascinating adventure, diving and holidays. Explore on a diving safari the beautiful islands of the Maldives and have great dives in the best reefs of the Indian Ocean. Relax on the sun-deck or in the whirlpool and visit the uninhabited islands of the Maldives. All tax subject to any changes!!! must be pre booked, payment only possible on board.